WITHIN six months of its implementation, the Integrated Action Plan (IAP), intended to boost development in Naxalite-affected regions, is heading for a change. At present, the plan is being directed by district-level committees with no public participation. The Planning Commission wants to alter this arrangement by imposing conditions on release of funds. Under the existing plan, a committee headed by the district collector initiates development projects related to health, education and employment in each of the 60 Naxalitehit tribal and backward districts. The committee consists of district forest officer and superintendent of police. The plan provides grants of Rs 25 crore and Rs 30 crore per district during 2010-11 and 2011-12, respectively (see box). The letter added, “In an era of Panchayati Raj, this kind of centralised, non-participatory structure with the complete exclusion of panchayati raj institutions, elected representatives…and the aam aadmi from any say in decision-making, is deeply retrogressive.” The prime minister “assured me that in the 12th Five Year Plan we would take up a scheme for central tribal areas on the lines suggested by the Commission. We are working on that”, says Shah. One of the main components of the proposed changes is imposing conditions before releasing funds under the plan. A district would be eligible for the next instalment of funds if it meets targets like implementation of Forest Rights Act (FRA) of 2006 and Provisions of the Panchayats (Extension to the Scheduled Areas) Act (PESA) of 1996, and strengthening of the Panchayati Raj institutions. The funds would be released incrementally over a period of five years, starting 2012. Another component is the set of five criteria, based on which a district can utilise funds. They are: a district should have 25 per cent tribal population, 50 per cent poverty ratio, 30 per cent forest cover, security-related concerns and be covered under the government’s Backward Regions Grant Fund. Any district which fulfils four criteria could be covered by the plan. But Sudha Pillai, member secretary of the commission, does not think the current plan is flawed. “Through video conferencing we are constantly in touch with the district-level committees,” she says. Ramesh Sharma of non-profit Ekta Parishad in Chhattisgarh, however, believes the “fundamental premise of the plan is skewed as it addresses the issue of development, while the main problem is that of rights”. According to the Madhya Pradesh Development Commissioner R Parshuram it is too early to say whether the plan is effective. “The funds were released towards the end of January this year,” he says. 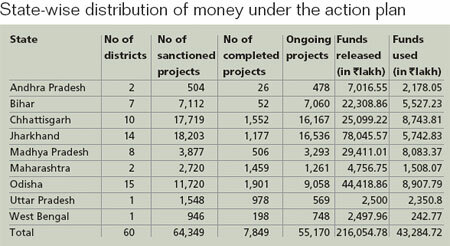 In December 2010, a total of Rs 1,500 crore was given to the selected districts. 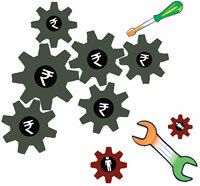 Till March 3, about Rs 133 crore had been utilised, according to the home ministry. Some of the money was misutilised. For instance, the district collector in Dantewada, Chhattisgarh, had approved purchase of baby weighing machines with IAP money. Absence of doctors, medicines and hospitals led to 140 deaths from suspected cholera in 2010 in Dantewada and Bijapur. In 2010-11, the Bijapur district health plan under IAP consisted of purchasing 10 ambulances for one crore rupees of the total of about Rs 522 crore. Suggested by the commission in 2009, IAP came into force in November 2010 after receiving Cabinet Committee of Economic Affairs’ nod.